Shepherd's huts ate back to a time before mechanised farming when all the work was done by hand or animals in the times of Thomas Hardy. Shepherd huts were a common site in the fields of England and especially here in Dorset where the fields needed more attention. 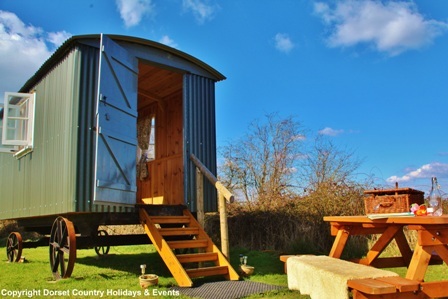 It’s therefore very appropriate to have a shepherd’s hut Glamping break surround by the fields that they were use to work on. To get nutrients into the soil before planting crops farmers used to let sheep eat the grass in the fields, once the grass had been grazed, and flock of sheep would be literally moved 'on to pastures new' and leave behind manure that would be ploughed in ready for a crop. A shepherd had to be with the sheep 24/7 and move with them so a mobile house was used and the Shepherd's Hut came into being. Such huts would be a shepherd's whole house and workshop rolled into one. There was no formal Shepherd hut design and originally shepherd huts were built as working 'buildings' so each was purely functional. The traditional shepherd huts had no luxuries like the ones offered at Dorset Country Holidays. An original shepherd hut would have had a stove to provide warmth and cooking facilities and a window on each side to allow the shepherd a view of his flock. 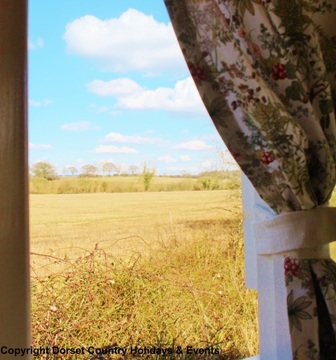 While a shepherd would have kept the top of the door open in his shepherd’s hut so he could hear his flock, you can just look at the beautiful view can close it when you wish instead.